The important aspect which was overlooked by AAR and needs attention is that Schedule III under Section 7(2) specifies that any services provided by an employee to the employer in the course or in relation to his employment shall be neither a supply of goods nor supply of services. In short, the consideration paid by the employer to the employee under the contract of employment shall be out of the scope of levy of GST. The term “in the course or in relation to his employment” has not been specifically defined under the GST law, which has to be taken from trade, commerce and industry practices. It is understandable that the provision made under Schedule III indicates not only the salary paid to the employees but also the considerations which are being paid to the employees as per the contractual agreement. What are the activities/consideration which can be treated as ‘in the course or in relation to the employment’? The dictionary meaning of the term ‘in the course’ means during the specified time and the term ‘in relation to’ means in the context of or in connection with. · Allowances mentioned as per the appointment letter of employees – travel allowance, food allowance, daily allowance etc. · Perquisites - Accommodation, car, meal vouchers, etc. · Reimbursement of expenses incurred by the employees in the course or furtherance of business. 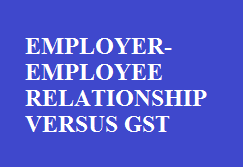 Last but not the least, Section 7(2) overrules section 7(1), thus makes it more flawless that any transactions which are provided by the employee to employer in the course/relation to the employment shall be out of the scope of GST. Once the activity comes under Schedule III, then anything contradicts or withstands this clause shall be ineffective or inoperative qua this clause. Can the meals provided at the subsidised rate be termed as ‘supply’ as held by the AAR? Can a mere payment of some portion of the cost render the activity as in the course or furtherance of business? Though the term “in course or furtherance of” is not defined under the GST but the word ‘business’ has been defined in the GST law. Broadly it means any trade, commerce, manufacture, profession, vocation, adventure, wager or any other similar activity whether or not it is for pecuniary benefits. Any activity ancillary or incidental to these activities is also covered as business. services by the employer exclusively for the employees as per the Factories Act. Can providing of canteen services to its employees be termed as an activity ancillary or incidental to trade, commerce etc.? as ancillary to the business activity of manufacturing footwear. Firstly, canteen services are provided is an ingredient of the wage negotiation with employer and would form part of the consideration under employment agreement. Secondly, Factories Act mandates the employer to provide food/meal to the employees and lastly, canteen cannot be termed as a business activity. Hence, if canteen can be termed as expenses for use in the course of business than a business activity itself, then the same cannot be termed as ‘supply’ to be taxed under GST. Though assumed, If providing of the subsidised meals to employees as per the contract of employment or as per the provision of various laws which makes it compulsory for the employer to provide canteen services like Factories Act, is construed as ‘supply’ under Section 7(1), even then the same will not prevail over Section 7(2).